Marco Ortigoza, a native of El Paso, is a 2008 graduate of Cathedral High School. He attended New Mexico State University in Las Cruces, New Mexico where he received his Bachelors of Criminal Justice in 2012 and his Master of Public Administration as well as Master of Criminal Justice in 2015. His role as the Director for the Center for Advanced Studies, is to serve as the focal point for the alignment of the Cathedral High School curriculum with higher education requirements; to serve as the liaison between Cathedral High School and the El Paso Community College with respect to College Early Admissions courses is responsible for the implementation of the College Early Admissions Program of the School. In addition, the Director, as the designated administrator of College Board electronic testing, is tasked with the responsibility of ensuring the timely administration of the College Board’s Texas Success Initiative® Test, and the College-Level Entrance Program (CLEP®) tests. 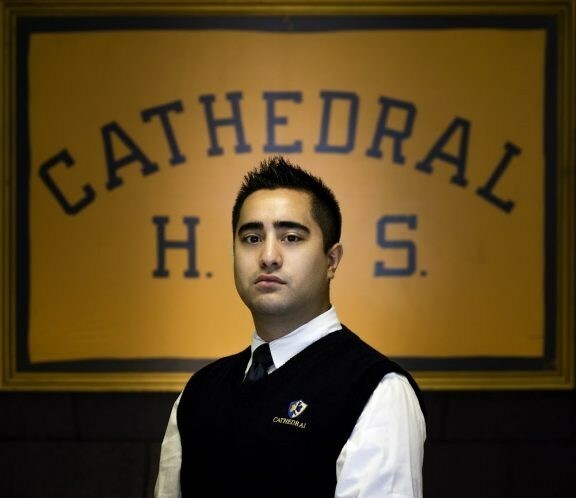 In addition, he serves as the coordinator of Cathedral High School’s Winter Writing Symposium which annually prepares participating seniors to compete for scholarships and other financial aid by developing creative non-fiction essays. Mr. Ortigoza (or Mr. O, as he has come to be known to the many students he has already served) is a member of the Academy of the Criminal Justice Sciences, the National Organization for Victim Assistance, as well as the National Criminal Justice Honors Society. In 2015, he was recognized as the National Criminal Justice Honors Society, National Member of the Year. Locally, Mr. O has been involved in many events regarding rights of crime victims, including events with local law enforcement agencies as well as the NM 3rd Judicial District Attorney’s Office. He has contributed to the formation of conferences in child endangerment, human trafficking, and domestic violence. His area of specialization involves issues in Victimology and issues relating to social justice, particularly issues of institutional discrimination within the criminal justice system. He is credentialed by the Southern Association of Colleges and Schools, Commission on Colleges and by the El Paso Community College where he teaches Cathedral students courses in Principles of Victimology, Criminal Justice, American Government and Politics, and State and Local Government.